Today, we’re here to make the case for recess! Learn 10 positive discipline strategies that are alternatives to removing recess as punishment for negative behavior. By now, most of you know that we’re big advocates of free play, movement, and sensory motor exploration here at The Inspired Treehouse. Sometimes it’s disheartening to see how infrequently kids are able to get up and move during the school day when our training and experience as therapists tells us that movement and sensory exploration are the very foundation of healthy development and learning. As much as we love using movement breaks, active learning games, and fidget toys with our kids at school, there is simply no substitution for good old-fashioned play in an open space when it comes to promoting developmental skills for kids. This is where recess comes in! But, we’ve noticed a trend. 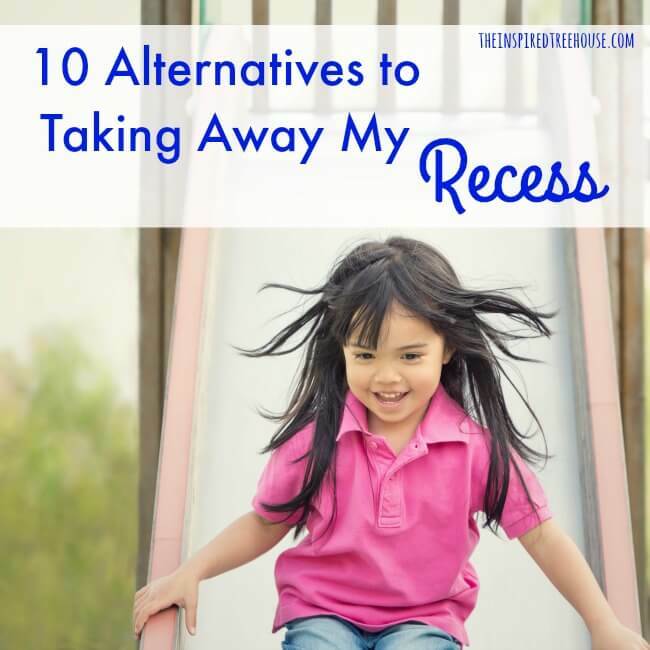 Because recess is the most beloved and cherished part of the school day, we often hear of it being taken away as a punishment for negative behaviors in the classroom. Today, we’re here to support teachers and administrators in thinking outside the box about behavior policies that result in the elimination of recess for kids. The bottom line? Kids need movement and sensory input to learn, attend, and regulate their behavior and they get these movement and sensory opportunities at recess. It has been hypothesized that some problem behaviors are directly related to a lack of participation in the very activities kids participate in during recess and other outdoor free play. “Repeat offenders” – kids who frequently demonstrate disruptive, fidgety, inappropriate, or inattentive behaviors in the classroom (and frequently end up standing to the side during recess as punishment) are likely the ones who need recess the most. This can mean getting caught in an extremely negative cycle that is detrimental to kids’ learning, development, and self-esteem. 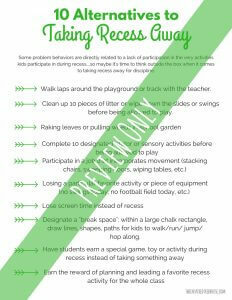 It looks something like this: kid struggles with regulating behavior in the classroom > kid loses recess (and valuable sensory and motor experiences that can help him regulate his behavior and attend) > kid continues to misbehave in the classroom > kid loses recess. Are you seeing a pattern here? Yep. Us too. So, we have a choice to make. Do we continue to take away recess as a punishment, or do we come up with other options to give kids more not less of what they need to regulate their bodies and behavior at school? We believe that unstructured free play is the most ideal way for kids to spend their recess time. But when discipline is necessary, there are alternative punishments that can still provide opportunities for kids to move and get sensory input rather than standing or sitting to the side during recess. 1 || Walking laps around the track or playground with the teacher. 2 || Cleaning up 10 pieces of litter or wiping down slides on the playground before being allowed to play. 3 || Raking leaves or pulling weeds in the school garden. 4 || Complete 10 designated motor or sensory activities to complete before joining friends on the playground. Check out this visual choice board for brain breaks. 5 || Participate in a job that incorporates movement (e.g. stacking chairs, helping in the library or cafeteria, delivering items around the school, sweeping floor, wiping tables, washing a window) before going out to play. 6 || Losing a specific (favorite) piece of playground equipment or a specific playground activity (e.g. no football today, no jungle gym today). 7 || Losing screen time instead of recess time. 8 || Designate a recess “break space”. Draw a large rectangle on the ground with sidewalk chalk. Inside the rectangle, draw lines/paths/shapes. Instead of standing/sitting, kids can walk/run on the paths or jump/hop from shape to shape. 9 || Earning a recess reward! 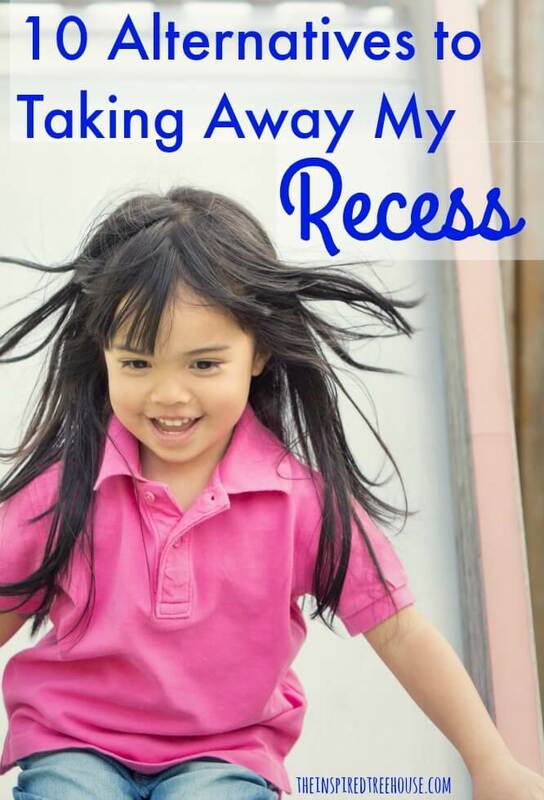 Instead of taking something away, what about having students work toward earning a special outdoor recess game, toy, or even extra recess for completing work or staying on track with behavior? 10 || Be the leader! Turn that negative behavior into something positive. 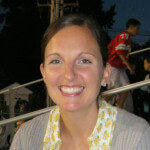 Have the student come up with 2 games involving movement and have them lead the entire class (a unique game of tag, an obstacle course, etc). Grab the download for only 99 cents! What about losing recess as a result of acting up AT recess? My son got a little rough playing with a friend and scratched him. As punishment, he was kept inside for recess the next day (they let him run around for the last 5 minutes, supervised). While I would have argued this punishment for being disruptive in class, I was unsure if I should argue with the decision for this case. What do you think? Hi Flora! Thanks for your question! Obviously, this comes down to the seriousness of the offense and the teacher’s judgment regarding how to keep kids safe at recess, but I wonder about having the child take a break if he hurts another child rather than losing an entire recess period? Or possibly losing another rewarding activity like ipad or computer time in the classroom? Also, redirecting the child to another activity or another group of children where the rough play is less likely might be another idea? I agree that kids need recess and that exercise will help with learning. Yet, I have always been an advocate of helping jobs (stacking chairs, delivering items, assisting in the library) are rewards for good behavior. It’s the idea of “getting” to do the job instead of punishment and “having” to do the job. I am also an advocate of having “the punishment fit the crime” so if the problem is creating a mess with paper towels in the restroom, then the child should spend time cleaning the restroom or picking up trash. Hi Jamie! I love the idea of being proactive and positive with helping and movement jobs – another great way to work in sensory input and movement throughout the day! I say contact the parents,but more importantly assign staff tot the recess area and supervise.in Detroit there is one adult per every 75 kids,at my grandsons school(Chrysler elementary,it’s more like 90).if theres rough play,all kids involved should get held back,not just one kid. In my opinion, helping around the school or home should be a reward, not punishment. Good kids that help others and grow up with that philosophy become cooperative adults. Besides, I don’t understand why should adults make kids believe that physical work is only for people that misbehave. Most of people that does chores are normal, good adults. We don’t have slaves or servants. Shouldn’t we aim for a society that values work and cooperation? My old school district tried to implement some of the suggestions above (picking up 10 pieces of garbage, cleaning off equipment, etc .) and had such a huge backlash from parents saying their children were being mistreated, they were treated like prisoners, how dare we make them work – you get the picture. We had to eliminate the program and went back to taking away recess. Sad. It is really important that consequences are logical and connected to the misbehavior. Otherwise they don’t make sense to the child, and don’t change behavior in the long term. For example, if a child throws food in the cafeteria, I’d have a conversation with the child about what the child can do to repair the damage. Many children will right away offer to clean the mess they’ve made, and if they don’t, you can easily guide them there. Cleaning the cafeteria, however, would not be a logical consequence for misbehavior at recess, talking in class, pushing in line, etc. Your post makes a lot of sense! Thank you! The only thing I have an issue with, is making kids walk laps (which was your number 1 alternative consequence). Walking laps, even with a teacher, makes exercise into a negative experience. With the rate of obesity rising, this, we need to show exercise in as positive a way as possible. Also, as a parent of an asthmatic child, I was horrified to think this could happen to my daughter. Even worse, the school makes the child walk in the heat of the middle of the day so that they can be supervised at recess time. Goes without saying, this could be dangerous. I am looking at writing my dissertation on the effects of taking recess away as a punishment and I like your alternatives. However, you seem to contradict yourself in the replies to people’s comments. I am completely on board with logical consequences but surely the logical consequence of not working during lesson time is to complete the work in your own time i.e. recess? Or you could separate discipline and recess. If discipline is to teach, what are we teaching? To fear that recess will be unpleasant if you do it again. These are simply loopholes that continue to be punitive.